Mobile fingerprint scanners have helped a police force to identify more than 2,200 people on the spot since August. 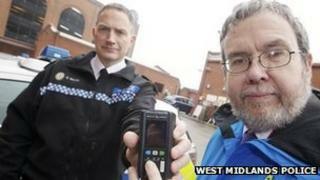 About 70 of the pocket-sized gadgets were being used by police teams in the force area, West Midlands Police said. Satellite linked to a national database, they tell officers if the prints belong to a convicted criminal. The number of people being brought in to custody to confirm their identity has gone down from about 130 a month to 25, the force said. Ch Insp Darren Walsh said: "Without the MobileID kits, confirming their identity would have taken much longer or they may have succeeded in convincing officers they were someone else and let on their way. "Traditionally, if officers had suspicions about an individual we'd need to take them to a police station, go through the custody process, and fingerprint them at the station which could take hours." Officers can cross reference against the Police National Computer to find out if a person is wanted by police or the courts. Has chip and pin had its day? A smart way to feed India's poorest?